In the UK, an individual can easily manoeuvre his/her ranks and become a locksmith. Unfortunately, there are no regulatory policies on who should be able to handle industrial tools whether they are educated or not. The Master Locksmith Association comprises professional locksmiths. But unlike the Associated Locksmiths of America, the UK association only collects dues from member companies rather than regulating trade licenses. Many at times, locksmith forums on social media are filled with stories of works gone awry, or an overcharged client lamenting high quotes. That begs the question, should locksmiths be regulated in the UK? We think they should, and here are some solid reasons why. The online space is now littered with new locksmith brands that market themselves through the Google Adwords platform. Creating an Adwords account takes at most, 15 minutes, and this online marketing strategy mainly works for the industry’s heavy spenders. If you’re willing to meet the PPC financial requirement, then you will appear on every website. That has led to the crop-up of incompetent but financially powerful brands that can hardly have the job done. 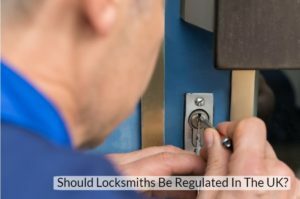 Without clear guidelines on trade licenses, any person in the UK can claim to be an experienced locksmith just because they work with a reputable brand that can cover all administrative matters. Such individuals lack the know-how and experience to work. Actually, most use that as an alibi to delve into shoddy schemes that tarnish a company’s name. A trade license draws the line between a competent locksmith and the mediocre lot. In the past decade, the rise in locksmith training courses has spiked insanely. Most of the training courses span from 2-7 days with accreditation. What most students don’t realise is that the industry is currently unregulated and any certifications from institutions like NCFE can hardly back them [aspiring locksmiths] up. The Master Locksmith Association is currently not providing a platform for blacksmiths to air their interests or acquire insights on regulations. Perhaps due to the fact that MLA can barely distinguish between a real locksmith and an amateur. By holding a license, a professional has a cause to fight for their rights by providing proof of being experienced and professional at what they do. Additionally, with such authority, they can become stakeholders in the formulation of laws that govern their practice.